An overhauled athletic compliance program has the University off NCAA probation and raising the bar for training, testing and awareness. Six years ago, the University of Minnesota athletics system was reeling. Cited by the National Collegiate Athletic Association (NCAA) for "significant, widespread and intentional" athletic code violations within the men's basketball program, the U was placed on probation for four years. When probation was extended by two years in 2002 following violations in the women's basketball program, confidence slipped among Gopher faithful. In the years since, however, the U has overhauled its athletic compliance program and is not only off probation, but serves as a model for peer institutions. According to athletic compliance director Frank Kara, the U has long held a reputation for being a "thick-file" school--one that reports any and every violation, no matter how small. The basketball violations, however, made it clear that thoroughly investigating and reporting known violations isn't enough. Staff and administrators who interact with athletes needed to be acutely aware of the rules, as well as comfortable with reporting potential violations. In a report to the Board of Regents in October 2006, Kara outlined the efforts of his office to improve education and awareness for employees who interact with U athletes. "In terms of the number of continuing education classes for staff and coaches, we're one of the top three in the nation now," Kara says. "And I can't name another program that meets with the university president and staff on an annual basis, but they interact with student-athletes and prospects, too. "Plus, no one is doing more communication than we are," he says. "Our auditors challenged us to find ways to measure the effectiveness of these communications, so we sit down with our staff and students periodically to see what they've picked up. These measures inform our educational programming and help us plan our tests." Tests are mandatory and are administered in an online format. Coaches and staff are typically given three weeks to complete the test, giving them time to seek the answers to questions they don't know. The idea is to reduce the pressure and encourage people to learn, says Kara. "It's good to be a thick-file school. ... I believe that when we turn something in now, the NCAA knows it's been investigated thoroughly." "Again, it helps us measure the effectiveness of our programs," he says. "We get e-mails and phone calls from other schools all the time, asking us to share our tests with them." The athletic compliance office also now reports directly to the University's general counsel, rather than the athletic director--an uncommon reporting structure that better reflects the independent advising and monitoring role Kara and his team are expected to play. "I think if you were to survey compliance professionals, Minnesota would be considered a 'model' department," says Chad Hawley, the Big Ten Conference assistant commissioner for compliance. 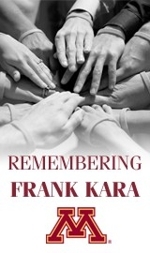 "Frank Kara is known as a leader in helping compliance professionals become better practitioners. He organized, and the University of Minnesota hosted, a conference for compliance professionals this past July. To my knowledge, it was the first seminar run by on-campus compliance professionals and focused on sharing best practices rather than providing education on legislation. The feedback from the event was exceedingly positive." * Emerged roughly 20 years ago as an area of specialization and part-time employment in competitive Division I schools as the NCAA began to define and discuss "institutional control." * Shifted to a full-time role at major universities approximately 10 to 15 years ago. * Requires strong communication skills and an aptitude for conducting research, establishing precedent and structuring arguments. Kara believes that only the medical and research fields have higher standards for compliance than intercollegiate athletics. The NCAA's standards make it difficult to measure any level of success short of perfection, however. "With regard to compliance, athletics is well ahead of the business world," says Kara. "With the passage of Sarbanes-Oxley, executives now have to sign their names to their financial reports. All 250 athletic staff members have been signing off on compliance reports for years now. "In the NCAA, however, a violation is a violation is a violation. Some schools might only report 10 violations a year. We know that we commit that many minor violations just through clerical errors and honest mistakes. Does that mean the rates of compliance at other schools are that much better than ours, or that our reporting structure is more thorough?" Kara sees rebuilding the U's reputation as a key benefit of full disclosure. "It's good to be a thick-file school. ... I believe that when we turn something in now, the NCAA knows it's been investigated thoroughly." In the future, Kara says he hopes to ramp up the University's efforts to educate sports boosters on NCAA rules. He also wants to enhance the "friendly compliance office" image he and his staff have established. "We have an open door, so people know they can drop in and get their questions answered," he says. "People need to feel comfortable reporting violations without worrying about job security. And most of all, they need to come away with the understanding that you can play by the rules and still win." ©2019 Always Dreaming Scholarship / SportsEngine. All Rights Reserved.